Made for sunshine and warm weather, this twist on the old classic uses V8 Splash, red wine and lots of sliced citrus to make it glow. dry red wine	 3 qt. 1. In large glass or plastic container with lid, stir together juice, wine and sugar. 2. Add sliced citrus and mix well. Cover and chill. Do not mix more than 3 hours ahead of serving. CCP: Serve beverage chilled to below 40 °F. 3. For Each Serving: Fill 16-oz. tall glass with ice half way. 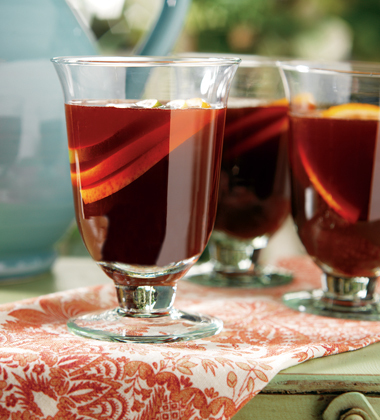 Pour 1 cup Juice-wine mixture over ice and top with 1/4 cup seltzer and serve with macerated citrus slices from Sangria mixture to garnish. Suggested substitutions: V8 Splash Berry Blend or Strawberry Kiwi; V8 V-Fusion Acai Mixed Berry, Peach Mango, Pomegranate Blueberry or Strawberry Banana.